Duckweed grows on benign neglect in the wild. However, to cultivate it in a garden setting, duckweed does have a few definite needs if it is to thrive consistently. 1. Like any vascular plant, duckweed needs a minimum of nitrogen, phosphorus, potash and micro nutrients. Sources can be as simple as a little humus and/or soil or compost tea. To achieve high protein levels of 40% or greater, duckweed needs added nitrogen, preferably in the form of ammonia from animal waste. This is why it thrives so well in fish aquariums. Nitrogen sources can include fish wastewater, chicken coop drainage, some types of grey water, vermiculture liquor, or aged manure. If a solid, place in a gunny sack and lower into the water column. This releases a steady amount of nitrogen and trace elements for a couple of weeks. Replace if you see duckweed roots grow to an inch or longer. Some people will occasionally spray the duckweed with an organic-based foliar spray as another source of nutrients. 2. Duckweed thrives at a pH of 6.0 to 7.5 If algae is present in large quantities, it can raise the pH to dangerous levels by virtue of CO2 production at night. The trick is to monitor pH, especially if algae is present. Encourage an adequate surface covering of duckweed at all times to suppress algae production. 3. Harvest duckweed as needed but leave about 1 1/2 to 2 pounds of wet duckweed per square meter on the surface of a pond daily. This insures enough of a cover to slow down algae growth or suppress it altogether. As an added benefit, this much covering also helps with mosquito control, water evaporation and temperature issues. More than 2 1/2 pounds of wet duckweed per square meter will result in its demise, as it self mulches at that concentration. 4. Duckweed prefers water temperatures of 50 to 90 degrees. Above or below that range, duckweed just sort of sits there. Much above 90 degrees, your duckweed crop will crash and it won’t be pretty. Ways to circumvent this is light shading from surrounding trees, plants or shade cloth hung over the growing area. 5. Keep water movement to a minimum. As duckweed floats on the surface, strong winds will push it to the edge of the pond where it will begin to pile up in layers, effectively self-mulching the layers beneath. Grow taller food crops around the perimeter to shield it from the wind. Duckweed is an amazing crop that gives much more than it gets, but still needs a few basic “gotta haves” in order to reach its full potential in a garden setting. There is a guy here locally (Phoenix) stating to add an air pump to the bucket the duckweed is growing in. He states it needs the oxygen and the movement..?? Would rather not if it will do better without. Hmm. Sounds fascinating. You’ll probably have to work out a dilution for your wastewater input. Don’t know if you’ll have enough retention time, like you said. It’s worth a small test site. Your shade cloth will have to be pretty thin so as to allow duckweed to grow from the center out. While duckweed can live on 20% of available sunlight, you are shooting for max. production, so I’d bump that percentage up a few notches. Keep me posted on your lab scale scenario. I’m really interested in starting some duckweed production myself. What I don’t have is a decent size pond to do it in. So I came up with this idea but would love to hear what your thoughts will be about it. If I start a spiral by knocking some pins onto a level area and connect the pins with a wire or cable let’s say about 500mm high. I would then be able to form a dam using a 3meter wide strip of PVC dam liner by just overlapping the liner with the wire and basically forming a spiral channel, and I only need to support the outer diameter with let’s say something like sand bags. The size of the dam will be about 100meter in diameter. The Idea is to feed the overflow of a bio digester, coming from a milking area to the centre of the spiral (Solids Removed). 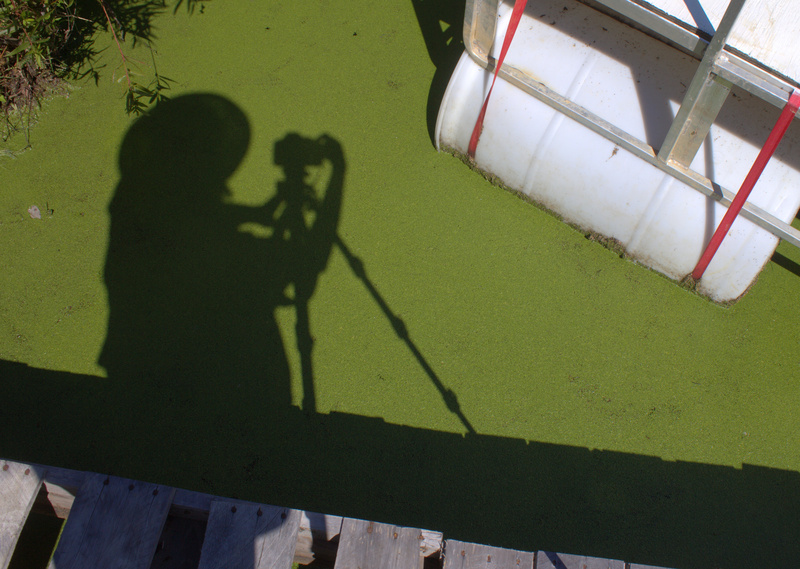 Then to only harvest duckweed around the outer edge and at the overflow. I hope that the duckweed will have enough retention time with the nutrient rich water from the centre of the dam and that the overflow will be clean enough to be used as drip irrigation for a vegetable garden. This Isolates the inflow from the overflow by having the water running around the spiral cannel ensuring you don’t get a short cuircuit straight to the overflow. The other advantage that I see with this setup is that the wind can’t blow everything to one side and it will be easy to cover the whole dam with some shade cloth leaving only the area where we harvest uncovered.